Contemplated the details of the rapid deterioration of the social and economic life of Yemenis, I realized how awful the impact of the ongoing war was especially on my birthplace of Amran Governorate, the most deprived community. I had been desperate that development interventions would find a way into Amran or Yemen in general in light of the continuing conflict and destruction on one hand, and on the other hand the absence of development actors except for SFD whose rile has been realized by the poorest now more than ever. All my family members were affected as my retired father has not received his pension salary for more than a year. We have not expected such a situation. The pain had almost killed me when I stayed walled up in my house unable to do the least endeavor that could change or alleviate the suffrage of hundreds of vulnerable communities. I had had nothing but to pray for them. All of the sudden, I received a phone call from a supervisor in an SFD offering me a job opportunity in participating in the Empowerment for Local Development (Tamkeen) project in Amran. I felt it was the largest opportunity of change for both my family and 60 deprived villages in Habor Dholaima in such critical conditions The details of the Tamkeen project replaced despair in my mind and heart with optimism and enthusiasm. I started to work, and my goal has been to change the villagers’ controversies and attitudes from war to development environment, at which I started to drive my capacities and enthusiasm. After training, I with other 39 colleagues worked hard in mobilizing the most vulnerable communities to rely to their capacities and locally available resources to improve their catastrophic reality. The Tamkeen teams already had expected more critical challenges but our challenge was so solid that none of the 40 male and female mobilizers has given up to challenges involving weapon-related threats, cultural rejection and walking alone for up to 10 kms in light of fuel shortage. However, we harvested the fruit and tasted it at the end of the day. We assessed the needs and worked to achieve priorities of 60 communities relying to their initiatives. Women in those communities have interacted unprecedentedly. Unexpected waves of women ran to the field of initiatives to eventually get rid of long standing and increasing burdens. For example, a group of women re-opened a narrow pedestrian road that had prevented their access to a water spring for four years. Then, they tirelessly cleaned that forlorn spring until it re-produced water. We focused on helping the villagers to hold free elections for the Village Cooperation Council (VCC) for each village, half of members are females, to lead initiatives, develop priority need plans, serve as a link between communities and any development agency including local authorities, and to ensure initiatives to continue in each village. The VCCs' members were trained, among other things, on ways to ignite hope in motivating initiatives to build their public assets and services and support the vulnerable. I noticed the communities were so motivated that I shed tears of joy once I saw the desperate of yesterday carried out 151 various initiatives during the first phase of the training only. By the end of our project, we have fulfilled 32 dreams for the youths who worked in the project. Those dreams have resulted in 254 initiatives of which 63 were community-based. The SFD contributed with half of its total cost of YR 28 million (nearly $60,000) which can cover the implementation of an SFD cash-for-work intervention. The initiatives implemented in such a short time and during the hardest times would not have been achieved in the district by other players within a decade. 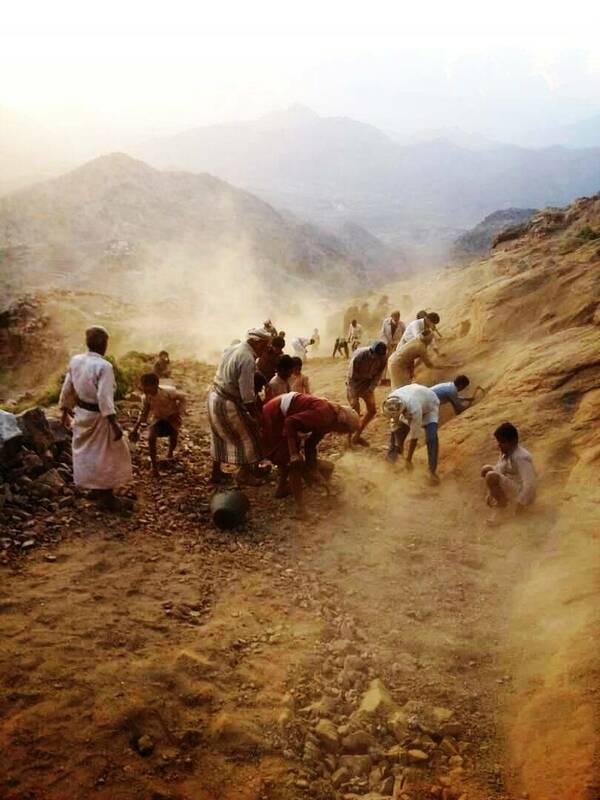 One prominent example of the community interaction, was the construction and paving of Al Faqi'a road (about 5 k long) which linked 5 villages to the center of the district and the capital of the governorate as well as the neighboring Hajjah governorate saving a half of the travel time and cost. It has been years since the villagers failed to convince the peer villagers to concede parts of their land for the road. As soon as the the VCC has been formed and trained in that area, the VCC members got the concession and all villagers rushed to donate money, started to work and provided guarding services for the project assets and meals to workers with the SFD half cost finance. Those have been our best periods of our lives as we got the fruit of our development training in RAWFD first and recently in Tamkeen. On the personal level, the living conditions of my family have improved from my $2300 contract with SFD. I have supported the family with the most needed food items, repaid our debt, supported my brother to buy spare parts for his taxi, and secured a bus seat for my sister for transportation to the university. All the above yields have freed my spirit and have strongly supported my career, as a rural female community mobilizer who is increasingly on constant demand by the aid organizations, that seek their interventions to be sustainable, effective and participatory.